The panel moderated by Rosanna Deerchild was part of Turtle Island Reads (TIR) — a CBC Montreal initiative celebrating stories written by and about Indigenous peoples in Canada. How are Indigenous stories currently being told in the media and where can things be improved? 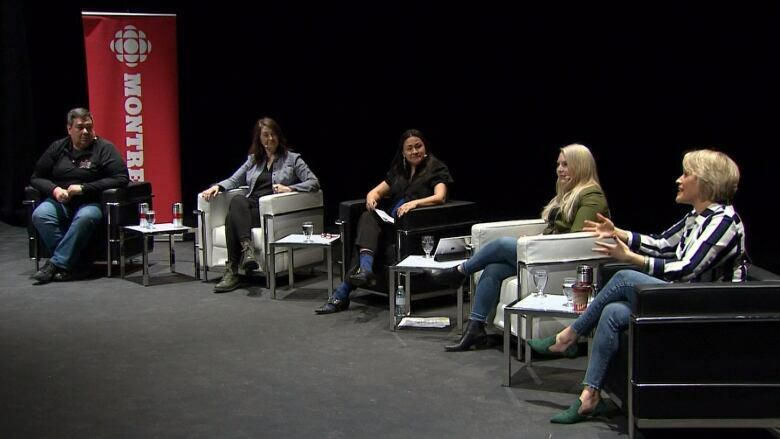 That's the topic that was discussed Monday afternoon by a panel moderated by Rosanna Deerchild, the host of CBC's Unreserved. The event was part of Turtle Island Reads (TIR) — a CBC Montreal initiative celebrating stories written by and about Indigenous peoples in Canada..
"Simply reading, or doing a workshop on reporting in Indigenous communities, guidelines, or any type of broad Indigenous sensitivity training can improve a lot of small mistakes," said Jessica Deer, a Montreal-based reporter and editor with CBC Indigenous. "But most of it boils down to just improving relationships," she said. Deer is one of four panelists who took part in Indigenous stories in the media: What journalists, filmmakers and other media professionals get right, what they get wrong, and how to improve things. The panel was streamed live on CBC Montreal's Facebook page. Jessica Deer, Montreal-based reporter/editor at CBC Indigenous. Brittany LeBorgne, actor/writer production coordinator at Rezolution Pictures. Michelle Smith, Dawson professor in cinema-communications; filmmaker; coordinator of Dawson College's transition program for Indigenous students, Journeys. Greg Horn, Indigenous storyteller and editor for Iorì:wase, the Kahnawake weekly print and online newspaper. Their conversation centred on issues representation in the media and in the film and television industry. Leborgne said that now is as good a time as any to widen the margins of what stories are deemed fit for popular entertainment. "In an age where we're recycling stories ... we have this pool of untold stories," she said. Horn agreed, saying that the way Indigenous people are portrayed on screen has a real impact in society. "It's important that non-Indigenous people see us as people. Not stereotypes," Horn said. The panel was followed by our Turtle Island Reads Book Club event, which will have a special focus on young adult books by Indigenous authors. That event will be recorded to be broadcast online on CBC in June to mark Indigenous Book Club Month. Turtle Island Reads initiative has officially launched!